We offer the best deal on lodging for the Park City and surrounding areas. 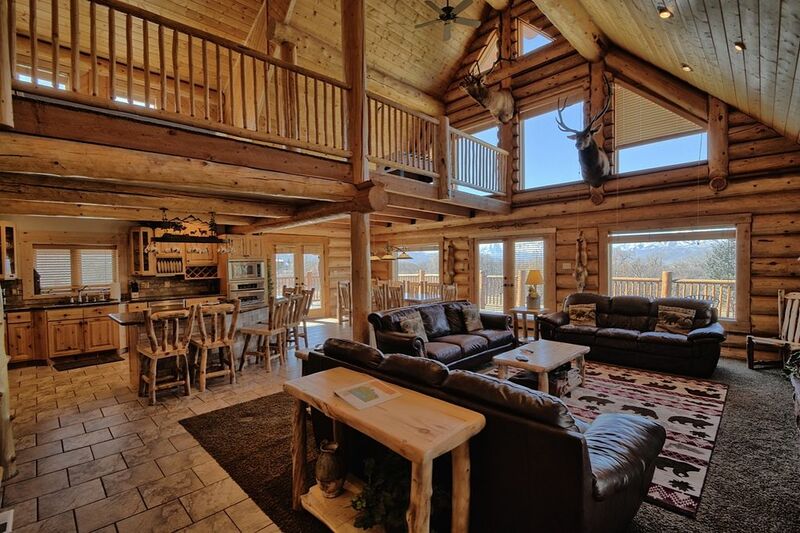 This Huge, private cabin is 5000-square-feet and is located about 15 minutes from Park City, on 1.5 acre private lot. Enjoy your next vacation in this deluxe log cabin. If we are booked during the dates you need, please see my other listings too!!! -Movie Room w/Surround Sound and so much more! Kitchen is fully equipped and has 2 refrigerators, dishwasher, microwave, cooking & eating utensils, toaster, coffeemaker, blender, pancake griddles (2), crockpot (2), and outdoor BBQ grill. Top-of-the-line amenities include: granite counter tops, stainless steel appliances, and rustic decor. The main floor is open with a great room, fireplace, dining area and kitchen, Master Bedroom and full on suite bath, laundry room, and attached 2 car garage. Huge deck and chairs provide extra eating areas with beautiful views. Upstairs, there is a loft and 2 large bedrooms with balconies and a full bath. Downstairs there are 4 bedrooms, 2 full baths and movie room with large screen 60 inch TV with surround sound, pool table and wet bar. The living areas are large so everyone can gather. This is our private home near Park City that we want others to enjoy. Get a great deal on your family reunion, ski vacation lodging, corporate meeting, or a weekend getaway. My name is Monica and I have owned cabins in the Park City area since 2007. I am excited to offer another amazing home for your vacation, reunion, or ski trip. I will work hard to meet all your needs throughout the entire booking process. The location is perfect because it's gorgeous, private and affordable. The cabin is conveniently located just minutes to Park City resorts, shopping and restaurants. Luxury without the high price tag. Also, you will also enjoy beautiful 360 degree views of Utah mountains. Open living room with 52' screen above fireplace. 1 step up from driveway to walkway and 1 step up from walkway to front porch that leads to the Front door with no additional steps. Our entire family enjoyed our stay at the Lake Creek Lodge. We were a group of 24 and the house amenities were perfect for our group. The large kitchen and gathering space were especially nice. Monica was very helpful and quick to respond to questions. Overall a very enjoyable experience! Everything about our stay was 5-star, from all the communication with Monica in the beginning, all the way through our time there, top notch across the board! Highly encourage you to check this place out, you will not regret it! Always good. We will be back again! We are a large group and this house is great for us. Great house. It gave everyone on the trip their own bedroom. Great place with even better owners. What's the line about seeing someone's true character when they are faced with adversity? It was the homeowners weekend from hell. It dumped snow, the heat went, the repairman was stuck in the snow. This all happens to everyone at some point. I wish it had happened another time, but it happened on our stay. But we had a great weekend. Monica showed up with a bunch of heaters and we made the best of it. I would absolutely recommend this house and these owners. I hope we get to go back. The house is great, it's well stocked with everything, and it's perfectly clean. Monica was always just a call away. She worked hard to get things fixed to ensure we had a good stay. I have the utmost respect for her. SAVE AT LOCAL ATTRACTIONS AND BUSINESSES BY BEING OUR GUESTS. We work with the locals to save you money on summer and winter favorites. CANCELLATION POLICY: RESERVATIONS ARE FINAL ONCE DEPOSIT IS RECEIVED. IF YOU NEED TO CANCEL, WE WILL TRY TO HELP ON A CASE BY CASE BASES. If you have other questions, please see the rental agreement associated with this property.